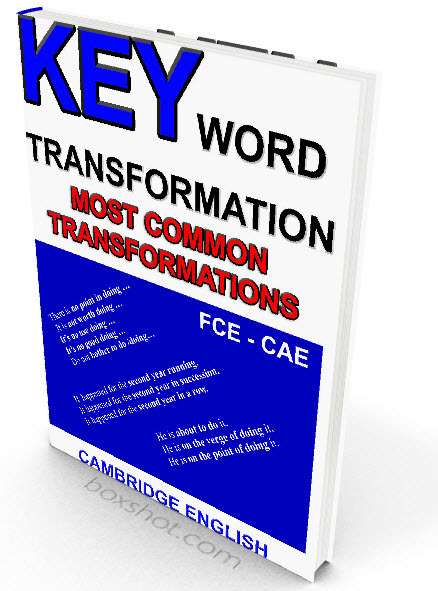 This e-book contains a compilation of the words and expressions that come up most frequently in the Key Word Transformation task of the Cambridge Reading and Use of English paper. It will help you to familiarise yourself with the usual transformations among set phrases , phrasal verbs, phrasal prepositional verbs, idioms ,etc. There is no point in doing that. There isn’t any point in doing that. It is not worth doing that. It’s no use doing that. It’s no good doing that. Do not bother to do /doing that. Do you think you could give me a hand to do it? Would you mind giving me a hand to do it? I 'd appreciate it if you could give me a hand to do it. I would appreciate it if you gave me a hand to do it. I would appreciate your giving me a hand to do it. I would appreciate you giving me a hand to do it. He ignored what she said. He took no notice of what she said. He didn’t heed what she said. He paid no heed to what she said. He didn’t pay any heed to what she said.